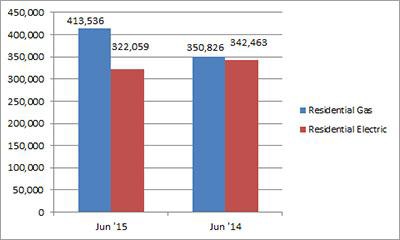 U.S. shipments of residential gas storage water heaters for June 2015 increased 17.9 percent, to 413,536 units, up from 350,826 units shipped in June 2014. 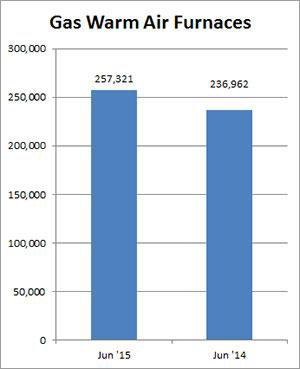 Residential electric storage water heater shipments decreased 6.0 percent in June 2015, to 322,059 units, down from 342,463 units shipped in June 2014. For the year-to-date, U.S. shipments of residential gas storage water heaters increased 8.0 percent, to 2,453,831, compared to 2,272,607 units shipped during the same period in 2014. Residential electric storage water heater shipments increased 7.1 percent year-to-date, to 2,313,209 units, compared to 2,160,629 units shipped during the same period in 2014. Commercial gas storage water heater shipments decreased 7.1 percent in June 2015, to 7,535 units, down from 8,111 units shipped in June 2014. Commercial electric storage water heater shipments increased 14.3 percent in June 2015, to 7,444 units, up from 6,514 units shipped in June 2014. Year-to-date U.S. shipments of commercial gas storage water heaters increased 6.5 percent, to 52,928 units, compared with 49,713 units shipped during the same period in 2014. Year-to-date commercial electric storage water heater shipments increased 13.1 percent to 42,733 units, up from 37,779 units shipped during the same period in 2014. 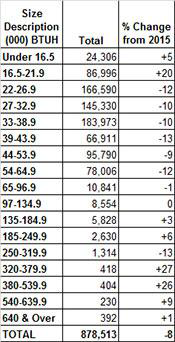 U.S. shipments of gas warm air furnaces for June 2015 increased 8.6 percent, to 257,321 units, up from 236,962 units shipped in June 2014. 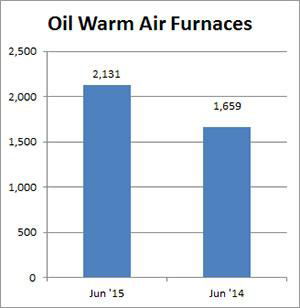 Oil warm air furnace shipments increased 28.5 percent, to 2,131 units in June 2015, up from 1,659 units shipped in June 2014. Year-to-date U.S. shipments of gas warm air furnaces decreased 0.7 percent, to 1,221,416 units, compared with 1,230,521 units shipped during the same period in 2014. Year-to-date U.S. shipments of oil warm air furnaces increased 14.4 percent to 14,108, compared with 12,332 units shipped during the same period in 2014. 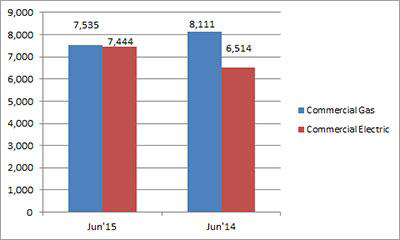 U.S. shipments of central air conditioners and air-source heat pumps totaled 878,513 units in June 2015, down 8.2 percent from 957,238 units shipped in June 2014. 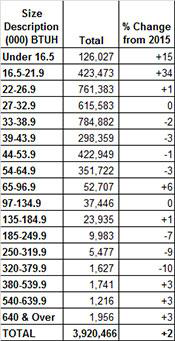 U.S. shipments of air conditioners decreased 9.1 percent, to 611,900 units, down from 673,296 units shipped in June 2014. U.S. shipments of air-source heat pumps decreased 6.1 percent, to 266,613 units, down from 283,942 units shipped in June 2014. 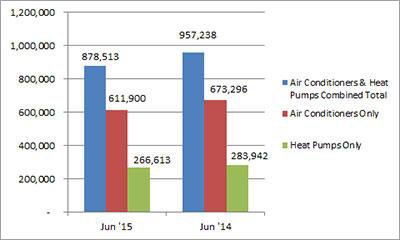 Year-to-date combined shipments of central air conditioners and air-source heat pumps increased 2.3 percent, to 3,920,466 units, up from 3,831,136 units shipped in June 2014. Yearto-date shipments of central air conditioners increased 2.2 percent, to 2,588,401 units, up from 2,532,548 units shipped during the same period in 2014. The year-to-date total for heat pump shipments increased 2.6 percent, to 1,332,065 units, up from 1,298,588 units shipped during the same period in 2014. BTUHs of 64.9 and below are for residential units; 65.0 and above for commercial. NOTE:A shipment is defined as when a unit transfers ownership; a consignment is not a transfer of ownership. Industry data is aggregated from the information supplied by AHRI member companies that participate in the statistics program and may be subject to revision. Published year-to-date data is inclusive of all revisions. No other AHRI data (e.g., by state or region) is available to the general public other than that published. AHRI does not conduct any market forecasting and is not qualified to discuss market trends.